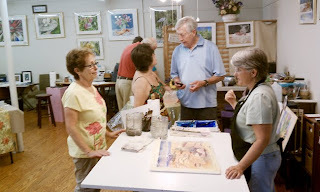 Last night was our monthly First Friday Gallery Walk in the Eau Gallie Arts District (EGAD). We had a nice turnout. During part of the evening I demonstrated some of my new painting techniques. The gallery featured three special shows. First, our Second Annual Miniature show, which was excellent. The quality of the work this year was amazing. Awards were handed out and everyone who visited really enjoyed the work. Second, our ongoing monthly Art of Eights Project was also showing. The 8 x 8 inch canvases are displayed in the gallery for one month, then on our website for three months. Each piece reflects the artist's personality and all are well-executed. Third, the front room of the gallery features several paintings by some of our gallery members who have won awards. Our award-winning pieces are showing throughout the month. Visit our gallery website to learn more. If you would like to participate in the Art of Eights Project, we welcome you! The application fee includes the canvas, which we provide. We do not take a commission if the piece sells, and so it is a wonderful way for artists of any caliber to earn exposure.